Archives of Eaton Bray News for December 2016. EBPC Neighbourhood Plan - Not just about housing! This article was published in December 2016. Please see Latest News for more recent information. However, a Neighbourhood Plan is not just about housing and is great opportunity for residents to propose positive ideas that can improve our health and wellbeing, for example by identifying new village facilities or improving the quality of any new buildings. In our Neighbourhood Plan, we could support opportunities that protect and maximise communal green and open spaces that will encourage the children, young people and adult residents of Eaton Bray to be more physically active. This could include looking at new ways to promote healthy lifestyle choices such as planting a community orchard or improving walking and cycle paths and marking routes that we could use for our regular trips through the village on foot, rather than in the car. Eaton Bray is a village fully surrounded by the open countryside of the Green Belt and with so many historical and environmental assets to enjoy. The Eaton Bray Neighbourhood Plan will help protect these. Meetings are planned for the last Monday of the month at 19:30hrs at the Coffee Tavern, Eaton Bray. Our November and December meetings were held in the Memorial Hall. The first meeting took place on 8th November, when our speaker, David Mercer, spoke on the subject of, 'A Life in Tennis'. The name David Mercer may be familiar to many of the readers, particularly to those who enjoy sports because David is a sports broadcaster, specialising in: tennis, badminton and rowing. David is a keen and gifted sports person himself who, when at school, won the Welsh Junior Doubles title in 1968 and captained his university tennis team in 1969. Having studied law at Nottingham University and acknowledging that he was not quite good enough to be a top level tennis player he did not take up sport for a living. Instead, he became a solicitor in Swansea, having qualified in 1973. However, the love of sport and with tennis in particular never fading, David took up umpiring and from 1973 to 1984 he umpired at Wimbledon. In 1983 he was in charge of the Men's Double Final and in 1984 the Men's Singles Final between Jimmy Connors and John McEnroe. He has also umpired many other tournaments including Davis Cup ties. Having won a competition organised by BBC Wales, David began broadcasting part-time in 1979 and in 1984 saw him broadcasting full - time when he became part of BBC Radio Sport in London. In 1990 he was appointed its tennis correspondent and two years later he moved from radio to BBC Television. Proudly he told his audience how much he has enjoyed being a member of the BBC's Wimbledon commentary team since 1985. There were numerous interesting, fascinating and anecdotal tales he told his audience, all of which were based on and around the subject of tennis. David also informed his listeners that he not only commentates for the BBC but also for BT Sport, Eurosport and a number of other networks. He is a former Chairman of the Lawn Tennis Writers' Association, a member of the International Tennis Federation's Media Commission, a Buckinghamshire Ambassador and a former member of the Sports Council for Wales. David was also interested in politics. In the 1979 General Election, David came within 401 votes for being the Member of Parliament for Swansea West and during the 1983 General Election he assisted in the Prime Minister's Private Office. David was a very interesting and informative speaker. It is fair to say that all members of his audience gleaned plenty of fresh information. A very enjoyable evening was had by all. The second Meeting took place on 13th December when we held our AGM and Jenny was re-elected our president. The AGM was followed by our delicious Christmas meal, which was provided by Jane and her team of Happy Helpers. Poems and anecdotes were recited by members of our meeting and the invited visitors from the three WI groups which Edlesborough WI is amalgamated, were presented each with a poinsettia. The speaker on this occasion was Colin Oakes, who spoke on the subject of his 'career' - that of being Father Christmas in a garden centre. The title of his talk was, 'Eighteen Years in a Grotto: Santa Speaks'. The talk was very festive but also reflected the change in the public's attitude towards people working with children. The evening concluded with a very successful raffle; with lots of donations. To those ladies, who have never been to a WI meeting or perhaps you have but for some reason have not been to one for some time, our next meeting will take place in the Memorial Hall on 14th February at 7.30. Why not come along? You will receive a friendly welcome. This, the 26th annual Puzzle that Gordon Gray has set, has a theme designed to help completion and will appeal to people who enjoy doing Crossword puzzles, such as in the Daily Telegraph (though it is not a Crossword puzzle). Puzzlers have plenty of time to find the answers and Puzzles should be returned, with donation, by 29 January 2017. Enjoy... Christmas Carols & Brass Ensemble Around The Village. 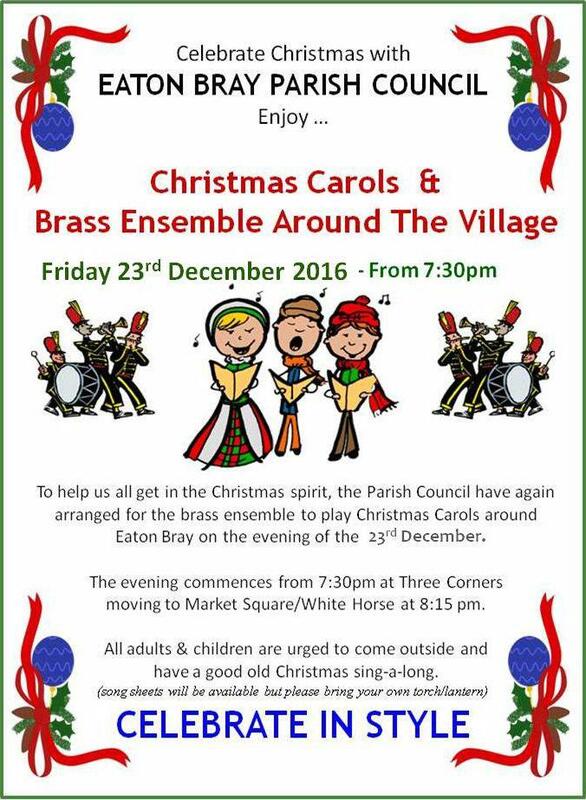 To help us all get in the Christmas spirit, the Parish Council have again arranged for the brass ensemble to play Christmas Carols around Eaton Bray on the evening of the 23rd December. The evening commences from 7:30pm at Three Corners moving to Market Square/White Horse at 8:15pm. All adults & children are urged to come outside and have a good old Christmas sing-a-long. It's that time of the year again (Oh, yes it is)! and once again the Curtain Call Theatre Group will be showcasing their big family pantomime at the village hall, Eaton Bray. The Jan 2017 panto is 'Aladdin...!' With a great script, dazzaling costumes, impressive set, plenty of laughs... and a wonderful cast of local faces, this is set to be an amazing show to suit all ages! This years script has been written by village local and funny man Gavyn Lugsden, who also Directs the show and appears as Widow Twanky! Gavyn said 'with a much richer budget than previous years, this is going to be an unmissable performance. Not only does the pantomime include all the ingredients you'd expect, there are also some added extras, including an amazing flying carpet scene, an hilarious laundry slap-stick routine and some new visual effects'. The cast also comprises of the children of the Curtain Call Youth Theatre Group, who will be adding their talents to this 'must see' performance. The pressure is on this year, as our last shows have gained us awards from the National Operatic and Dramatic Association (NODA), who once again will be in attendance to see if we can make it three in a row! 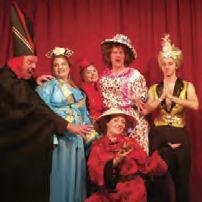 The plot for Aladdin is well known and the traditional story has been adapted for the village hall. Join Aladdin and his brother 'Wishee-Washee' and his Mother 'Widow Twanky' in their quest of good versus evil in the heart of Peaking. Will the evil Abanazar take control, will the Princess Jasmine end up marrying Aladdin, will the Genie of the Lamp save the day, will the Peaking police force actually do something right...? Well, for the answers to these questions you will need to book your seats and find out for yourselves! Aladdin will be played by Tiff Campbell (Ex Haven Mate and proffesional singer), The princess is Kaytie Allan (recently graduated from stage school), Gavyn Lugsden (ex Butlin's Redcoat & Drama teacher) will be playing Widow Twanky, Abanazar will be played by local (and Cedars teacher) Malcolm Callaway, Wishee Washee is played by, A grade drama student Shauna Lugsden & the Genie has been interperated by the hilarious Reuben Womersley de Zaldua. The show is set to run from Friday 27th to Sunday 29th of January 2017 over 5 performances. Tickets can be purchased on-line by visiting the group's website and clicking on the 'buy tickets' tab (curtaincalltheatregroup.co.uk) or by calling 07510 164888. There will be a licenced bar and refreshments available, plus a raffle which is supported by local businesses. This years show has been sponsored by Plumm Property, whose boards can be seen throughout the village promoting the event! What is the name of Aladdin's brother? Text your answer to the mobile number (above) starting with the word 'Focus' followed by your answer. Competition closes at midnight on Saturday 14th January 2017. The winner will be contacted the following day. The Rev Jenny Spouge made a welcome return to us for our October Cafe Service, when we had a lively and interesting discussion on healing and the importance of treating people holistically. On the third October Sunday, we were all moved by Melvyn Corby's sermon urging us to hold fast to the Word of God, the key to the spread of the Gospel. Our new minister, Nigel Bibbings, led the Communion Service on the fourth Sunday. The theme of his service was 'God's unconditional love which is available to all'. He urged us to stay on track and be faithful to God throughout our lives, reminding us that He will be faithful to us whether or not we are successful. As usual when there is a fi fth Sunday in the month, we and the Edlesborough Methodist Church congregation joined our friends in the Salvation Army at their morning service. It was a typically joyful occasion with a characteristically warm welcome and a very meaningful sermon on God's amazing grace. The Saturday Cafe Community programme started again on the second Saturday in October and was a very pleasant event with a number of new visitors. Central Beds Council will publish the draft version of their Local Plan in December 2016.. This will set out the additional development, in 3 categories (residential, employment and traveller sites), that they are looking to implement by 2030. Landowners in Eaton Bray have submitted a greater acreage of sites than all the other villages in the near vicinity combined. Eaton Bray Parish Council have been advised by CBC that they expect 150-300 more houses to be built in Eaton Bray. You are viewing the December 2016 archive.